Google has issued another update to its recently released Gmail application for iOS that adds a number of new features and quashes various bugs. Version 1.1 of the free Gmail app now offers a new notification sound to those running iOS 5, custom signatures, a “scribbles” feature, and more. Within the application’s settings menu, users can now create a custom mobile signature that will replace any signature they have setup on their desktop when sending emails from the mobile app on the iPhone, iPod touch, or iPad. When receiving email, those running iOS 5 on their device will now hear a new notification sound that replaces the default “tri-tone” alert that you often hear when receiving a new text message. Another addition is the new vacation responder, which is also accessible from the settings menu. This allows you to setup an automatic reply to new emails you receive between certain dates. Simply tell Gmail when your vacation begins, when it ends, and what you’d like it to send and it’ll take care of the rest for you. Arguably the biggest new feature, however, is “scribbles,” which lets you attach drawings, sketches, signatures, and more to your emails. To access scribbles, simply hit the new scribbles button that sits at the top of your display when composing a new email. 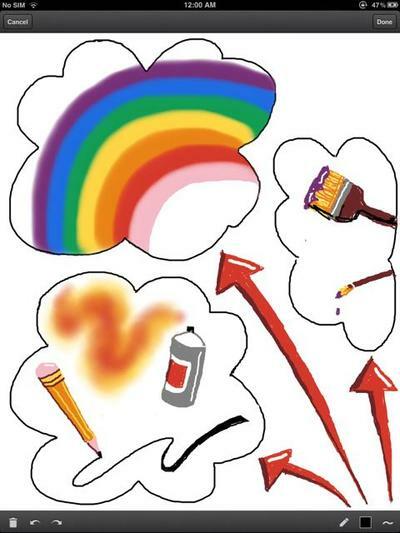 You can then create your doodle using either a pencil or a spray can and a number of different colors. While I’ll use the feature merely to send silly pictures to my friends, it’s likely to be handy for those who need to digitally sign documents quickly while they’re on the go. The update also includes “numerous bug fixes and UI improvements,” according to Google, and I’ve certainly noticed that the app seems more stable now. It’s great to see that Google’s putting a lot of effort into the Gmail app for iOS, which means it’s only going to improve over time. In future updates, you can expect support for multiple accounts, banner notifications, and a new “Send As” feature, according to the official Gmail blog. What do you think of the new Gmail update for iOS?